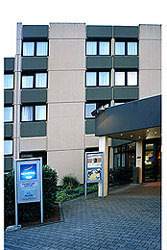 Our Hotel is situated near the airport in a quiet area, just a few minutes from the city centre. A free shuttle service is running daily from 6.00am to 11.00pm. 150 air-conditioned rooms, meeting rooms, a indoor pool, sauna and parking facilities.